Principal Dr. Jeff Mulqueen wanted to do something unique to recognize student achievement in the junior high/middle school department of Ashford School in rural eastern Connecticut. One hot summer afternoon he and one of the school's custodians mulled over ways to put the spotlight on seventh and eighth grade students who exhibit extraordinary effort and achieve high academic grades. "The custodian suggested that we could use the floor [to display some sort of recognition]," explains Principal Mulqueen. Together they formulated a plan which has transformed a ramped school corridor into a rising Walk of Fame. "We experimented with some markers and wax...introduced the idea of a star...and before you knew it, we invented the Walk of Fame. It is a hit with the kids and teachers," Dr. Mulqueen says proudly. And the "star walk" was high on the list of neat features newly appointed Superintendent of Schools David Marchesseault insisted I see during my recent tour of the sprawling building. Each star is made using a simple template and permanent marker. 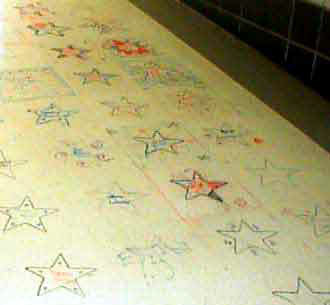 Students use permanent marker to personalize and decorate their stars. Then a custodian waxes over their works of art to preserve them for the rest of the year. "At the end of the school year we start all over again....stripper removes everything when we do our summer cleaning," Mulqueen explains. "Student recognition is always on my mind," says Dr. Mulqueen. "Now students who make honors, high honors, or four "1's" (a grade of "1" indicates excellent effort in a subject area) are invited to a party during study hall and also get to personalize a star on the floor." The kids really get into it!" It's obvious from his enthusiasm that the principal enjoys the process, too. Jeff Mulqueen is enthusiastic about the 571 student, pre-k through grade eight school where he has served as principal for three years. "The spirit of collaboration among teachers, students, and parents working together supports the learning climate at Ashford School. True collaboration means working together with the understanding that consensus makes us strong. Our many accomplishments are the source of much pride for everyone." It appears Ashford School benefits from a whole galaxy of stars. Contact Kathleen Carpenter (kathleen@teachers.net) with suggestions and information for future articles about innovative and creative school administrators.